This Four Roses 130th Anniversary Review was shared with us by Loren Simpson, who is quite possibly the biggest Four Roses fan there is. Loren hosts a Four Roses Charity tasting, which is going on its 3rd year this February in order to raise money for the Special Ops Xcursions. 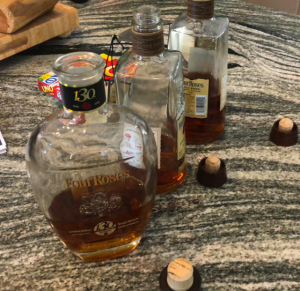 1 – Loren knows his Four Roses. 2 – You’re going to want to be at that event in February. 3 – Loren is one of the most generous guys I’ve met. After last years limited edition release taste testing was finished I promised myself I would conduct the 2018 testing with various types of glassware and do the tasting with a 6 hour / 6 glass format. The 2018 Limited Edition Small Batch (SMBLE) demands this format. The results reflect all aspects of the 6-hour test. The release of the Four Roses 130th Anniversary started as certain people received beautiful preview sample boxes. These boxes remind me of the Apple box concept where people want to keep the boxes. Nice job marketing! I haven’t read or watched the pre-release reviews but I’m glad this is taking place. The Mellow Moments Sneak Peek was well done although a bit hot under the tent. The staff did a great job putting on the event. The next two days should be terrific for Four Roses fans. The Four Roses 130th Anniversary branding makes the bottle “Pop” with the black neck band and the round logo. On the back is the short version of 4R history. Other than that, the bottle appears the same as last year and does not list the %’s of the recipes or the age statements. I opened the bottle last night when I got home and let the bottle sit “top off” at 73 degrees for 12 hours with no light. The end of the distilling process where the white dog gets put into a charred white oak barrel is where the color develops and the bourbon finds its brown amber color variants. The color is light, not dark. In each glass the color appears to have the mahogany color I like. I’m going to call it as “Tawny” after looking at it in all the glassware, under magnification, and with a pantone chart. At 54.2% I didn’t expect anything darker really. The juice does not appear or feel oily to me. In the glass there is some stickiness with slow moving medium legs. In the bottle it is hard to really tell and I’d avoid judging color that way. The nose, aroma, bouquet is elusive at first in each of the six glasses. There is not heavy alcohol so you can use just your nose and not your mouth. There are at least 5-6 phases the aroma goes through for me. In each glass I detected nothing at first. Then gradually I started to get some kitchen spices like clove and cinnamon but just faintly. After about 5 minutes of smelling the glasses I started to get vanilla. Then the vanilla kept coming and wouldn’t stop until I started to get some coffee bean or maybe a rich candy. I did not get anything sweet or floral at all. I thought I’d get some wood flavors on the nose but didn’t. It took a very long time to record any real opinions even with 6 styles of glassware. I spent most of the 6 hours tasting and re-tasting. 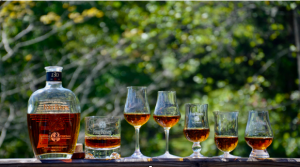 I’d go through the glasses focusing on making sure the bourbon made it to all parts of my mouth and tongue. The F and V yeast strains come at you like nothing I’ve tasted together before. I kept waiting for the K to hit me but it took a long time to deliver that spice from the 16-year OESK. I was looking hard for it so maybe I got caught up hoping. My only real negative and this is just me but I did get a very slight banana in the large rock glass. Just a little but it messed me up enough to stop and take a break. There is toffee for sure but not overpowering. The toffee connects with the wood and creates a nice balance. The flavors build and build until they hit the top of the mouth where I start to get oak and then the fruit. I’m not getting any heat and nothing sticks in any one place very long. Nothing overwhelms but there is a unique lingering. I imagine the Rye geeks will enjoy this greatly. The vanilla is the highlight, so much so that I really can’t think of another offering that has delivered rich vanilla in this way. I like it and it definitely grew on me unlike any other SMBLE. This maybe what I like about it best, we’ll have to wait and see. The finish is elegant. All it does is make you want to take another sip. The lingering just kept going and going. Could be a great nickname for the 130th– “The Lingerer”. On the wide rocks glass, I did get some mint at the very end. At the end of the tasting I started to get custard and possibly a cake taste that spilled into the finish for me. So, what is my opinion of the Four Roses 130th Anniversary? 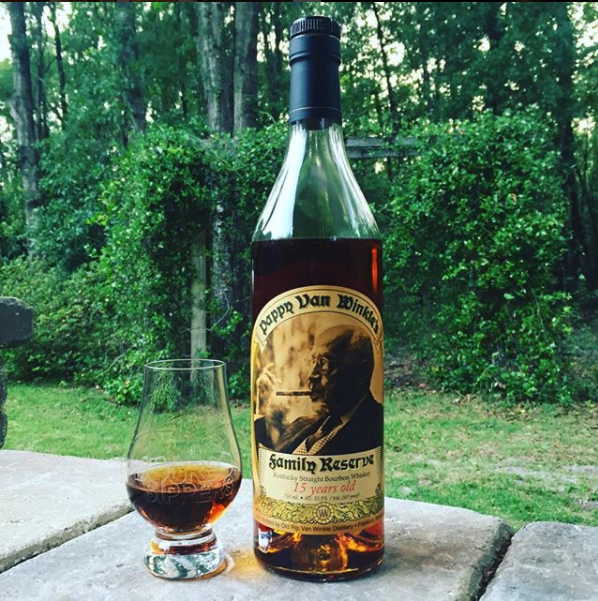 We do have a bourbon that is worthy of being labeled a Limited Edition make no mistake about it. You can tell Brent, Ashley, and team labored endlessly over the project to deliver a product worthy of being the Four Roses 130th anniversary release. I’m not sure what I like most about it after looking, smelling, tasting, and note taking – I can’t find anything I don’t care for. I do think this bourbon needs to be consumed with or after a heavy meal. The rich vanilla needs a heavy pasta or juicy steak as a base. Well worth the wait and cost is not prohibitive. For everyone wanting to compare it to another year of SMBLE, I can only say I’m not sure that is the true test but don’t worry I’ll go there. I can say that I like where Brent is headed and his style is elegant, powerful, and not influenced by anything or anyone. The 2018 will be talked about until we are sick of hearing about it BUT that may just be why it turns out to be one of great SMBLE’s. This pour is fun to talk about, it takes so long to determine what and why you like or dislike a certain aspect of it. If you’re hosting a local tasting this will be a great addition to get the crowd talking bourbon. The 2018 will undoubtedly rank high for most against the 10 other SMBLE releases. Out of the 11 total SMBLE releases this is top 4 for me. I’m placing the Al Young 50th anniversary in a category of its own and not including it here. I look forward to blind tasting against, 12,13,15,17 to dial in my opinion.